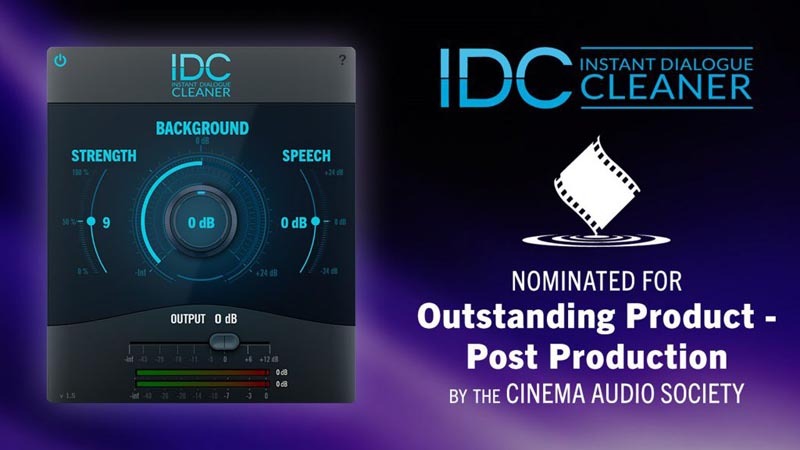 LOS ANGELES, – IDC: Instant Dialogue Cleaner, Audionamix’s first real-time, cloudless solution that uses artificial intelligence to clean up speech, has been nominated for Cinema Audio Society’s 2018 Outstanding Product in Post Production Award. The winners will be announced in a sealed envelope ceremony on February 16 in the Wilshire Grand Ballroom at the InterContinental Los Angeles Downtown. The IDC: Instant Dialogue Cleanerplug-in uses deep neural network (DNN) artificial intelligence to automatically clean up speech through an intuitive interface, with the turn of a knob. Unlike traditional denoisers that learn and remove noise profiles, IDC automatically detects and separates speech regardless of the surrounding content. IDC therefore excels where other tools struggle, and addresses complex audio issues including wind, birds or insects, car and plane interference and troubleshooting distant, roomy recordings. Users can quickly and easily clean up dialogue from production audio, field recordings, news and sports recordings and more, making it the perfect tool for audio post professionals, dialogue editors, re-recording mixers and broadcast engineers. An updated 1.5 version of the software was released in December 2018, offering a wider range of users the ability to separate and preserve speech.